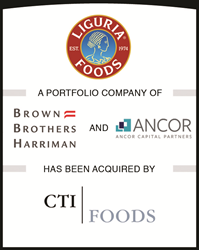 BlackArch Partners is pleased to announce the sale of Liguria Foods, Inc., a portfolio company of BBH Capital Partners and Ancor Capital Partners, to CTI Foods, a portfolio company of Thomas H. Lee Partners and Goldman Sachs & Co.
BlackArch Partners is pleased to announce the sale of Liguria Foods, Inc. (“Liguria” or the “Company”), a portfolio company of BBH Capital Partners and Ancor Capital Partners, to CTI Foods, a portfolio company of Thomas H. Lee Partners and Goldman Sachs & Co. Founded in 1974 and headquartered in Humboldt, Iowa, Liguria (http://www.liguriafoods.com) is a value-added foodservice solutions partner that manufactures high-quality branded and private label pepperoni for the large, expanding $1 billion U.S. pepperoni market, with a particular focus on independent and multi-unit pizzerias and sandwich shops. The Company supplements its pepperoni offering with a full suite of other dry sausage products and protein pizza toppings. Liguria has aggressively built market share by combining highest-quality ingredients, consistent recipe formulation and Old World processing techniques with a commitment to understanding and addressing customer needs. BlackArch was retained by BBH Capital Partners, Ancor Capital Partners and management to serve as their exclusive financial advisor. BBH Capital Partners, a private equity fund sponsored by Brown Brothers Harriman & Co., provides friendly capital solutions to growth-oriented middle market companies. The firm typically invests between $25 million and $100 million per platform investment and has the flexibility to act as a control or non-control investor. Ancor Capital Partners, based in Southlake, Texas in the Dallas/Ft. Worth metroplex is an operations-oriented private equity firm focused on lower middle-market companies with EBITDA of $5-$15 million. Extensive operational experience gives the Ancor team a unique understanding of the critical business issues faced by lower middle-market companies. Ancor’s proven track record includes 45 acquisitions to date in healthcare, consumer and other industries. BlackArch Partners is a leading middle‐market investment bank offering a full spectrum of advisory services to financial sponsors, private companies and diversified corporations. BlackArch addresses the needs of owner‐operators, founders and shareholders of private companies with specialized services that include M&A advisory, strategic advisory and private capital solutions. Headquartered in Charlotte, NC, with offices in Houston, TX, BlackArch features a total of 12 industry‐focused practices that cover all sectors of interest to middle‐market investors; BlackArch professionals have closed more than 300 transactions in 16 countries on four continents. Please visit our website, blackarchpartners.com, for more details.